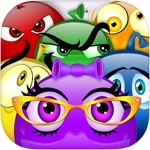 Match "Rokie" icons to shatter your way to the alarm clock and wake Al up in this addictive new game! Want to know what’s happening in your neck of the woods? Al Roker, America’s favorite weatherman, is here to tell you that, and more. 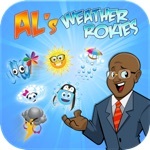 “Al’s Weather Rokies” incorporates your area’s forecast into exciting game play with Roker’s new app. Your role in this addictive puzzle game: Don’t let Al oversleep! He’s done it only once, in his entire career spanning nearly four decades, and you’re challenged to break through his weather-filled dreams and wake him up so he’s not late for work again. That’s right, Al loves the weather so much, he often dreams about it! It’s up to you to wake him and get him to the studio. In this innovative game, players flick quirky characters, called Rokies, at matching icons in Al’s dream to clear a path to his alarm clock. The goal is to break through the weather Rokies in order to strike the alarm clock and wake Al up. At the same time, those adorable Rokies are all weather themed, and on some levels, change according to your city’s forecast.